In June 1974 this station began on 6225 kHz. The transmissions started up with Jungle Jam with The Shadows. 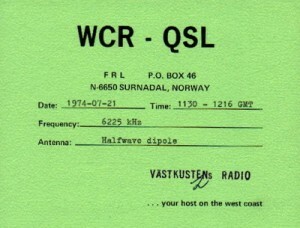 They was connected to FRL and when they broke down, WCR was quite for a while and then they was back with a new address in England, and with a new frequency, 6207 kHz.